A village that was founded during the 17th century under the name of Dörfl. This name was then changed to Harrachsdorf after the owners at the beginning of the 18th century. The area was first made famous thanks to its glassmaking industry and ore mining, but is now better-known as a tourist resort and sports centre in the western Krkonoše Mountains, mainly thanks to its ski-jumping competitions. Tanvald-Kořenov-(Harrachov): Unique in Central Europe, the beautiful scenery of the Krkonoše and Jizera Mountains, and a number of tunnels and viaducts, this is the steepest railway line in the Czech Republic. 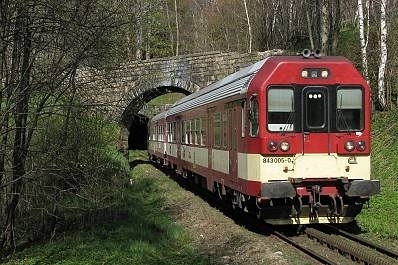 The track conquers an altitude difference of 235 metres over the 7 kilometres between Tanvald and Kořenov thanks to a two-belt rack rails Abts-system. The largest inclination is 58 per mille. 1022 metres above sea level. Two four-seater chairlifts lead to the summit, whilst there are downhill runs of all difficulty levels on the northern slopes. An ideal spot in which to get a good view of the area. The mammoth ski jump, one from only six built in the world. 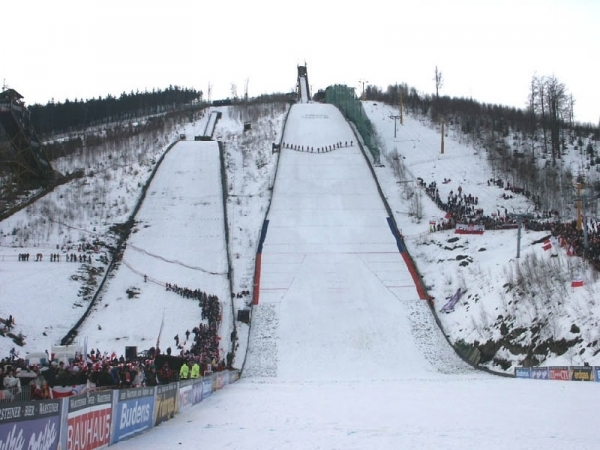 With a critical point of 185 metres, the current record for this jump of 214.5 m is held by Matti Hautamaeki (9.3.2002). 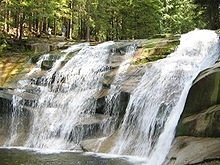 The waterfalls are 10 metres high and take up the entire watercourse. Giant hollows known as “the Devil’s Eyes” are found in the river not far from here. These hollows were created by the flow of the water and stones. The Novosad & Son glassworks and microbrewery. 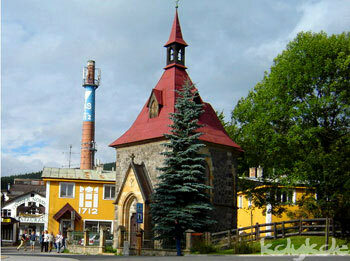 The glassworks was founded in 1712 and is the second oldest in Bohemia. It hand produces blown glass, cut glass, engraved glass, painted glass, and other decorated glass. Also manufactures chandeliers. The Chapel of St. Elizabeth and its glass bell can be found next to the glassworks. The bell is 50 cm high, weighs 10 kg, and was cast by Julius Klinger in the local glassworks in 1916. Also worthy of note here are the altar and its Venetian mirrors and the richly-ornate stained-glass windows. The highest mountain of border crest, the Krkonoše Mountains, and whole Bohemia (1602 m). The mountain is a popular destination for excursions. 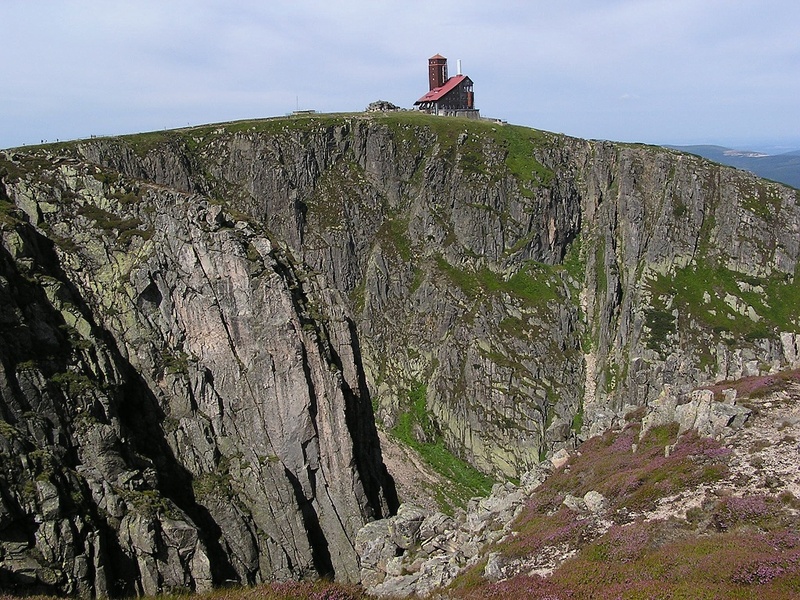 The bleak, rocky summit is some 30 acres in size and crosses the state border with Poland. The name “Sněžka” dates back to the 19th century and is a deviation of “Sněžná”: snowy cap. This nature reserve is on the Polish side of the border ridge with lakes of glacial origin. 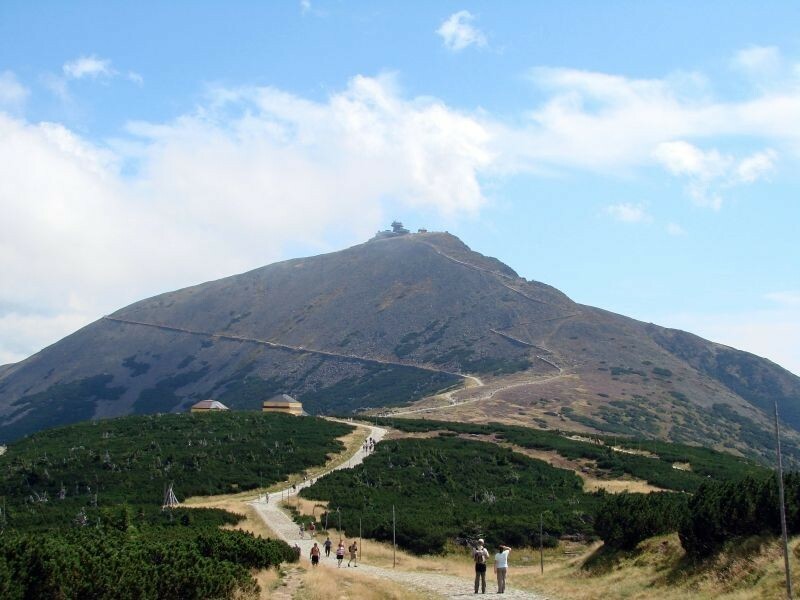 Near the snow pits you find the highest peak in the Giant Mountains zápodních - High Wheel (1506 m). 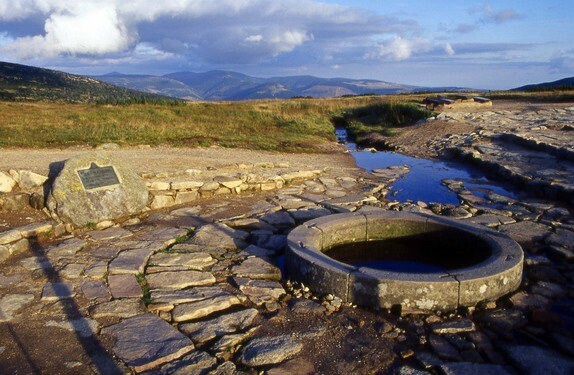 The spring of the River Elbe, which sits at an altitude of 1386.3 metres above sea level consists of a concrete shaft ring from which the water trickles and flows into a small stream. It is surrounded by a number of stones, which were later added to with plenty of comfortable benches. Not far from here is a small wall which features the coloured crests of the towns through which the River Elbe flows. The neo – Gothic Štěpánka is the oldest lookout point in the Jizera Mountains and stands on the summit of Hvězda. 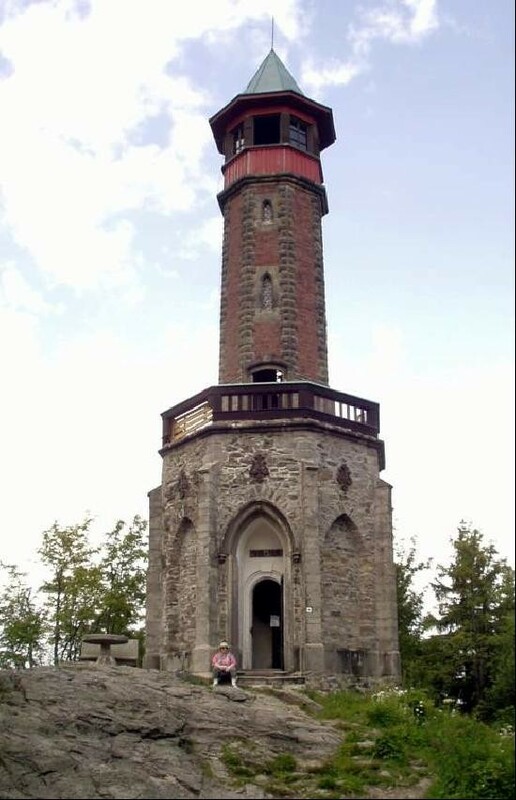 The building of Štěpánka viewtower was begun in 1847 by Duke Camill Rohan, however, the works had stretched to other 40 years and its inauguration was held until 1892. The view from the neo – Gothic , over 20-meter high stone tower includes Krkonoše, Jizera Mountains, Bezděz, Ralsko and Lužické Mountains. 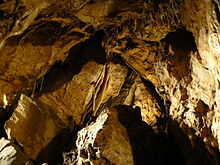 The only accessible dolomite caves in the Czech Republic and ones that feature uniquely adorned walls and ceilings. The decoration consists of ledges, ridges, and lattices of quartz. The caves are also home to the largest underground lake in Bohemia and are also adorned with stalactite and stalagmite decoration. This mighty, early Gothic castle built by the powerful family Ronovci, from this time comes the core of the cylindrical tower, which today dominates the whole structure. 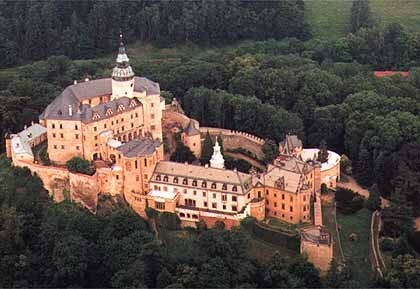 In 1278 passes Frýdlant castle in the nobility of Biberštejn who extended it to other objects. The picturesque settlement Jizerka is situated on a small plateau in the heart of the Jizera mountains and is the highest settlement in the Czech Republic. The first mention of the settlement comes from 1539 as the seat of watchmen. Later were peopled by woodcutters and collectors of precious stones. In the mid-19th century there were established two glassworks, one of which serves to this day. Establishment of the first glassworks commemorates the stone pyramid in the middle of the village. The history and natural riches of Jizerka and Jizera Mountains you can learn if you visit the museum, located in the old school. 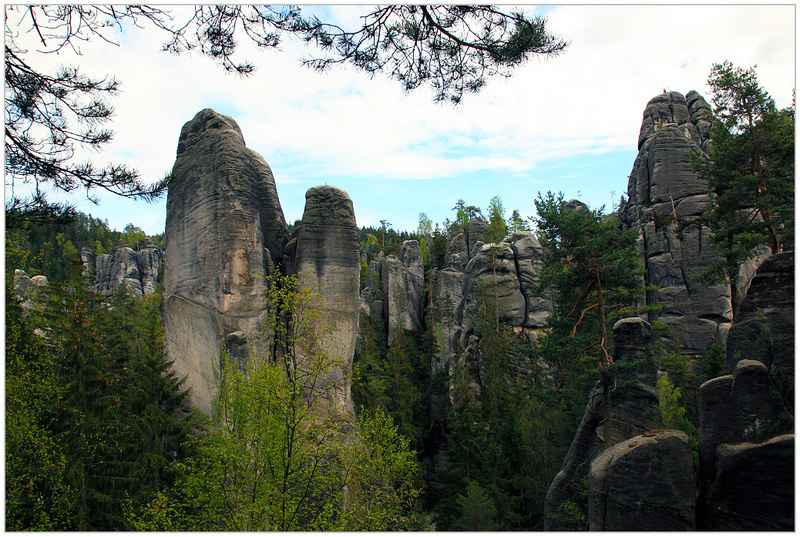 There is a national nature reserve and passes through here as well as the whole Jizerka, trail. There are exceptional opportunities for hiking, excellent terrain for mountain biking and in winter the tracks for cross-country skiing. It was at the beginning of the 18th century that Adršpach witnessed the arrival of tourism, whilst the Teplice Rocks saw the influx of the local population and incomers even later. The rocks were opened to the outside world after a forest fire in 1824. This natural disaster prompted the discovery of the rock town here, which had been overgrown and inaccessible until that time. První zmínky o existenci Jablonce pocházejí z poloviny 14. století. První osadníci se zabývali hlavně zemědělstvím a patrně i hornictvím. Sídlí zde textilní a strojírenské firmy a výrobci nábytku. Jablonec je cílem mnoha letních hostů i lyžařů. A Baroque monastery and the Krkonoše Mountain Museum (nature, culture, the environment, a flowing stream with live exhibits, crafts). Information centre - displays of folk art and craft and the development of tourism in three historic buildings on the square. Chateau park with nature trail, mini ZOO, and wooden bridge. The city of Liberec is situated in Liberec valley between the Ještěd ridge and Jizera Mountains. Its history dates back to the time when these places have led trade routes. Liberec was created as an open market village, and later determined his physiognomy. A small settlement, first mentioned in 1352, during the 15th and the first half of the 16th century gradually changed into a tributary town. At the end of the 16th century, thanks to the extraordinary construction activity, the first stone of the building. New fundamental changes recorded in Liberec in the second half of the 18th century, when the center of the town of brick houses in the classical style. The beginning of the 19th century saw the development of textile industry and industrial architecture, which helped to acquire the status of an independent city. There were three consulates, 50 textile factories, 60 factories focused on metal, including automobile manufacturing RAF. Currently Liberec offers many attractions. The city boasts many important buildings, eg. The town hall, built in Renaissance style and finished in 1893. Behind the Town Hall theater Franz Xaver Salda from 1893. 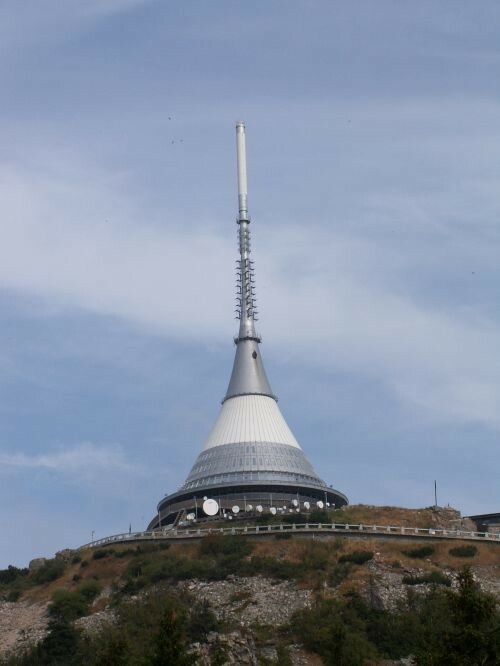 Liberec is sometimes also called the city under Jested, whose peak, rising up 1012 m, is decorated with a modern tower, which became the dominant feature of the region. ridge of 1012 m high peak crowned a remarkable silhouette of a mountain hotel. The attention of tourists this place has enjoyed since time immemorial, always? first tourist cottage our ancestors built here back in 1844. Ještěd is not only a symbol of the city - also offers a breathtaking view of the surroundings. The main tourist attraction of Babylon is a big water park. It consists of a set of pools with water spouts, waterfalls, cascades and water slides. Another tourist magnet is Luna Park. The complex is also concentrated a large shopping center with more than sixty shops. Botanical Garden was founded in 1876. Here you will find year-round collections of flowering orchids and carnivorous plants, the oldest camellias in Europe and the longest tended bonsai in Europe. Total is seen 7,500 kinds of plants in greenhouses and 1,500 species in the outdoor section. Liberec Zoo is systematically built since 1904. It covers 15 hectares, on which the visitor encounters 170 species of animals. Among the most famous include the exposure of predatory birds, Rothschild giraffes, snow leopard, lions macaques, penguins and of course, white tigers.